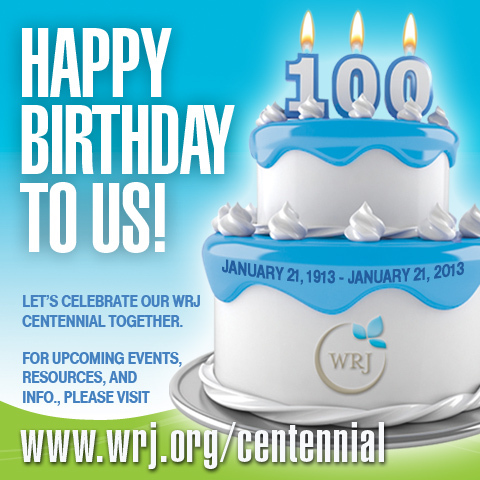 View our complete list of Centennial Ideas. Hello Sisterhood Presidents! Have you noticed the request at the top of the page to please forward the Chai Line to your board and committee chairs? We have an easy way to make that happen. If you create a list in Excel of your board members and committee chairs, listing first name, last name, and email address (each in a separate column), we can add them to the recipients who get this newsletter automatically! No more forwarding! Please send your list - and any questions you may have about our new format - to chailinewrjpd@gmail.com. We have a lot more options using this special email program. We can embed videos, link to documents, and even see exactly who is opening the Chai Line each week. We hope this new format is appealing to you and serves your needs. 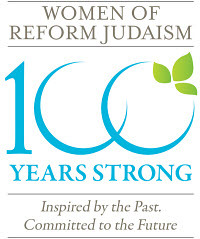 Women of Reform Judaism, in cooperation with the American Jewish Archives, has launched a special project to kick-off its Centennial Celebration - a WRJ Centennial Archival Collection at the American Jewish Archives in Cincinnati, OH. As part of this effort, WRJ is asking sisterhoods across North America to submit artifacts showcasing their individual history that will become part of the collection and will help tell the story of the women of the Reform Movement during the past 100 years. WRJ recently hosted a special Artifact Webinar presented by Rabbi Samuel K. Joseph, PhD, Professor of Jewish Education and Leadership Development at the Hebrew Union College-Jewish Institute of Religion in Cincinnati. Watch a recording of the webinar or download the PowerPoint presentation. Show this to your board or at a larger membership meeting. The Archive Project is looking for old pictures, records, reports, and minutes from years past. Look at the attached Guidelines sheet for more information. December 15, 2012 was the deadline for the January 2013 display at the American Jewish Archives. Artifacts, in general, will be accepted anytime between now and the end 2013. You can either mail, email, or fax your artifact. We hope you will get your sisterhood involved in showcasing your own sisterhood's history to your congregation. This is a once in a lifetime opportunity and we know you will be with us for this outstanding year. WRJ/Beth Israel Sisterhood of Portland Oregon is beginning a lone soldier parent support group. Who are "lone soldiers"? Each year, thousands of young immigrants and volunteers arrive in Israel alone, to join the Israel Defense Forces (IDF) and do their part protecting Israel and the Jewish people. Lone soldiers serve in the IDF while their parents and loved ones remain at home, thousands of miles away. Over the last several days, many lone soldiers have been called up to serve in Operation Pillar of Defense, both from within Israel and abroad. The Lone Soldier Center in Memory of Michael Levin supports lone soldiers before, during, and after their IDF Service. There are over 5,000 lone soldiers serving in the IDF today. The Center's goal is to provide them all with guidance, meals, and a warm community, so they will no longer be alone. If you are the parent of a lone soldier in Israel, or you know someone who is, please contact Daphna Stadig at topsys@comcast.net.